The last couple of batteries I have had were Bosch Group 47. Part number 47-600B. They fit well and look good under the hood. Bosch have discontinued that battery so I am looking for suggestions. The Bosch 96R-590B seems like it will fit although it doesn’t have the bottom hold-down ‘lip’ like the stock battery. The dimensions and CCA specs are close. Is anyone using this battery or have other recommendations? I usually go to O'Reilly's or NAPA... no big deal. 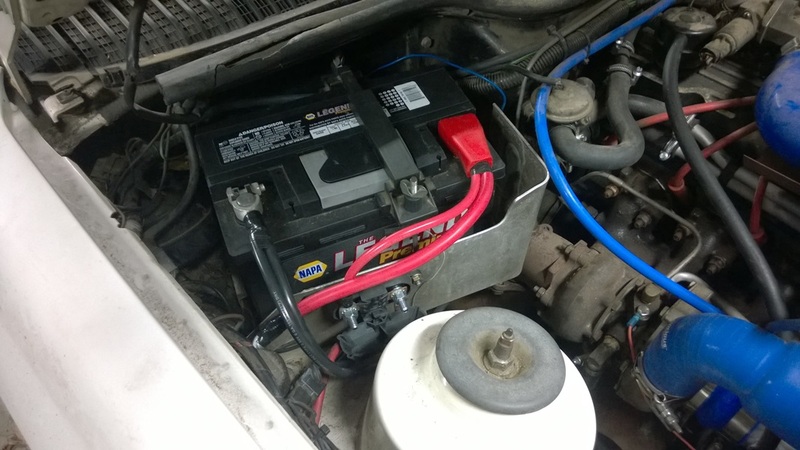 I am using whatever battery a 1995 W124 Mercedes E320 would use. Unfortunately I can't read the BCI number in my own picture. I know a friend of mine used a battery in common with a B5 A4 V6 and it fit well. I just replace mine but I went with a Duralast gold because of the 3 year replacement free warranty and 5 years prorated . Wasn't too bad in price either 182 out the door. OK - just to close out this question, I ended up with another Bosch battery and got a pro-rated discount off the new one since it is warrantied for 96 months - 8 years! Thanks for all the suggestions but I wanted one that fit exactly as the OEM one did with the lip and hold-down clamp and the top strap. Even though the old battery is discontinued, it is replaced with another one which is just about identical in size and has a little better cold performance. Not that I need that. The new part number for reference is Bosch PJBH5-650B. Sounds like you made the right decision. My current Interstate battery doesn't give me problems so far.